We offer a full travel advice and immunisation service. If you are travelling abroad please complete and submit the travel form in plenty of time (we recommend 2 months) before your journey. Many of the immunisations for travel are available on the NHS. However, some medications are not available on the NHS for travel purposes. Contact the surgery for latest vaccination charges. 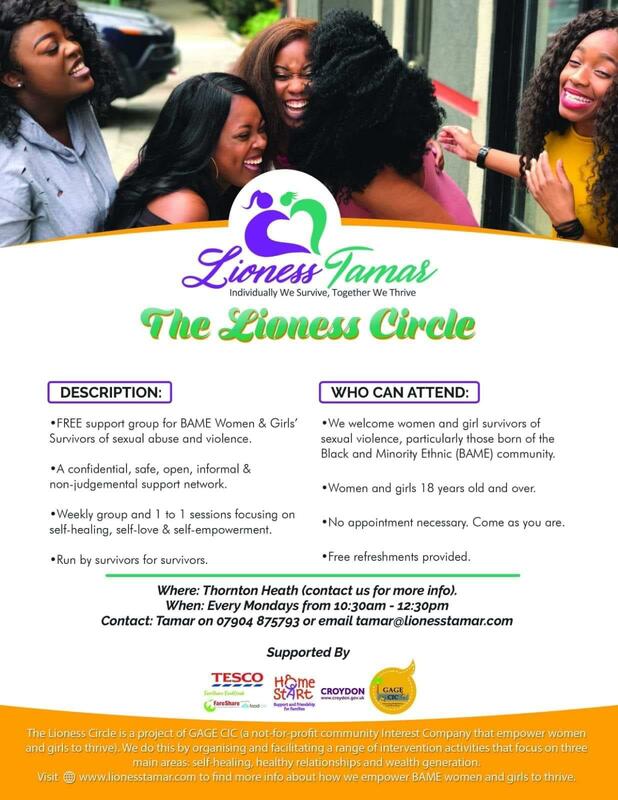 A free support group for BAME Women and Girls’ Survivors of sexual abuse and violence. A professional and passionate team working in a centre of excellence, dedicated to the healing and empowerment of survivors of sexual violence. Help is available for you at the Family Justice Centre. The centre is run by a multi-disciplinary team that works to provide you and your family access to support services. Our aim is to listen and respond to your needs in a safe way. We give emotional and practical help to people who have been affected by crime in the London Boroughs of Southwark, Merton, Sutton, Wandsworth, Lambeth, Greenwich, Lewisham, Bromley, Croydon and Bexley. Croydon Safeguarding Children Board (CSCB) is the statutory body that brings together local agencies that work to safeguard and promote the welfare of children and young people up to the age of 18 in the borough. We have been at the forefront of shaping and coordinating responses to domestic violence and abuse through practice for over 40 years. We empower survivors by keeping their voices at the heart of our work, working with and for women and children by listening to them and responding to their needs. We work with people who are subject to immigration control and have No Recourse to Public Funds (NRPF) as a condition of their immigration status. These groups of people are mainly asylum seekers and refused asylum seekers with health and social care needs, people unlawfully present in the UK (e.g. overstayers) and people who have leave to remain in the UK with NRPF conditions attached to their leave. The Croydon Hearing Service provides advice, information and practical help and support to residents of Croydon with any type of hearing loss. Cruse in Croydon offers free support and counselling following the death of someone close. Woodside Bereavement Service provides bereavement counselling to families living in the Croydon area experiencing severe or prolonged shock or depression arising from bereavement and loss. The Macmillan Centre offers cancer information and support services. It has been developed as a joint venture between Macmillan cancer support, Croydon Health Services, Citizens Advice Centre, South East Cancer Help Centre and people with cancer. The centre is based at Croydon University Hospital. SECHC aims to give any person affected by cancer an opportunity to explore ways which may help them to cope with their situation. The Centre aims to respect and support them in the choices they make and to provide individual and group support, complementary therapies and information within a friendly, caring environment. Croydon Carers aim to make a positive difference to the lives of unpaid carers in the diverse communities of Croydon by supporting and providing them with a range of services, support and recognition. We support carers in Croydon looking after a relative, partner or friend due to illness, old age or disability. The Young Carers Project is a free, friendly and professional service, offering support to young people who are caring for a parent or sibling. If you are aged 7-25 and caring for someone with a physical disability, mental health issue, long-term illness or learning difficulty, then our service is here to support you. Health Help Now has been developed by North and East London Commissioning Support Unit with input from local GPs and other health professionals. It lists common symptoms and offers advice and suggestions for treatment. Programme for 4-11 year olds. A free 8 week mindfulness course in the Croydon Area. Starts Tuesday 30th April at 4:00-4:30pm, during term time only. Many parents need advice, support and friendship during the early years of parenthood. Home-Start helps families by providing practical and emotional support in the home where there is at least one child aged 5 or under. Free swimming returns to Croydon for summer 2018! Young people aged 16 and under can keep cool and get active this summer, when free swimming sessions at Croydon’s five leisure centres return on 21 July. Complete an application form online through the Better website: www.better.org.uk/freeswimcroydon, or through the self-service machines at your nearest leisure centre. Customers will then have to collect their card from within the centres. ID may be required should someone appear to be over 16, or under eight. Best Start is a service from pregnancy until your child turns 5. It is made up of a number of different organisations all working together to give your child the best start in life by offering both targeted and universal support. These are the routine vaccinations that are offered free of charge on the NHS to all babies and children in the UK. Download the Chatterbox Flyer April to July 2018. Family Lives is a charity with over three decades of experience helping parents to deal with the changes that are a constant part of family life. With Healthy Start, you may be qualify for food vouchers and healthy vitamins if you are on certain benefits. The free vitamins can be collected from Best Start children’s centres and health centres. You also qualify if you are under 18 and pregnant, even if you don’t get any benefits or tax credits. The Change 4 Life app shows how much salt, sugar and saturated fat is in those family favourites. Get simple swaps to help you cut back on the sugar in your kids’ food and drink. The health visiting service is provided and available to all children aged 0-5 years. The service aims to promote the health and wellbeing of your family and can offer practical advice and support on a range of topics. View the Child health clinics timetable. Along with all practices in Thornton Heath Network we support the running of many community activities that we encourage you to join in with. Take a look at what’s on offer…. Whether you fancy joining others for a healthy walk, need some advice about money worries or someone to talk to about other stresses or problems, there is likely to be something for you, and most activities are available free or for a low fee. The Parchmore Centre is a Methodist Church that works with local government and other community groups/agencies and local residents to provide a space in Thornton Heath for local people to access community provision. They also offer a nail cutting service on the First Thursday of each month from 10am. For a full list of all activities and details of who to contact please visit their website. St Paul’s Church has being embedded in the local community for many years. We have a host of activities that we run in conjunction with the local community. For a full list of upcoming activities and details; please feel free to drop in or give us a call to find out more. Age UK Croydon offers a wide range of activities and services, mainly at our new base at 81 Brigstock Road, Thornton Heath. For families that want to learn to cook healthy. Would you like to feel calmer, less stressed, sleep better, focus more easily, identify and transform negative thinking to live a more positive and fulfilling life? The Mindfulness may help. Patients over 50+ with mobility issues please join us for our free Swimming program. 12 weeks, regular attendance advised for full benefit. Please ask your GP, Nurse or Health Care advisor to sign you up for our Free 12 week programme. Free over 65’s Golf. Interactive “no-frills” golf sessions. Have fun whilst being active with friends old and new. All abilities/disabilities welcome. All adaptive equipment provided. Come and join Janey for group exercise. All levels of fitness. All welcome! Dance Therapy classes, no booking required and you can register on the day. If you are living with dementia or know someone who is, come and join us for activities, games, music, conversation and friendship. Location: This is in association with Croydon age UK and will take place at Age UK, Croydon, 81 Brigstock Rd, Thornton Heath, CR7 7JH. materials and refreshments provided! Look forward to seeing you there. Croydon Healthy Homes supports Croydon households struggling to heat their homes and pay their fuel bills. The scheme is for people who own their home or rent it from a private sector landlord, and is aimed at families at risk of being in fuel poverty or with a member living with a medical condition which could be exacerbated by living in a cold home. There is no charge for a Home Visit or any of the measures fitted (Home Visits will be allocated on a first come, first served basis). Referrals (or self-referrals) for a Home Visit Using take place online: www.croydon.gov.uk/healthyhomes; call freephone number 0800 292 2529 (Monday to Friday 9am to 5pm) or by completing a paper referral. Eversley Practice will be hosting a series of fortnightly workshops led by All Inclusive looking at ways to improve your finances. Workshops run from 2-3pm at Eversley Practice. You’re invited to Foodcycle Norwood Junction for a tasty 3-course meal. of the community in Croydon and its surrounding areas. Crystal Palace Transition Town is part of the Transition Town movement, a community-led response to climate change and shrinking supplies of cheap energy. We run projects that reduce our carbon footprint while building local resilience, sustainability – and lots of friendships! The aim of the centre is to work with the community to help connect us all to the food we eat and how it is produced. We want to empower people in our community by teaching the invaluable skills of growing and cooking with sustainably produced food and, as we grow, we will strive to give better access to affordable healthy produce to the local community. To see all the activities and events on offer and details of who to contact please visit their website. We are a free and confidential NHS service provided by the South London and Maudsley NHS Foundation Trust. We offer a range of psychological therapies to adults 18 years and over, who are registered with a Croydon GP. Free and confidential counselling to young people aged 14-25 who live, work or study in Croydon. Relate are the UK’s largest provider of relationship support, and every year they help over a million people of all ages, backgrounds and sexual orientations to strengthen their relationships. Cassandra Centre offers professional and confidential counselling and Therapeutic services. Working with individual women, men, families and young people. Croydon Drop In is accessible, confidential, independent, safe and flexible for young people (aged 11-25) seeking free support and counselling. You can self-refer or refer others to Croydon Adult Social Care. If you feel you or someone you know is in need of this service please get in touch. Having trouble understanding your teenager? Come in for a cuppa and a chat.Come in for a cuppa and a chat. Maybe together we can find a way to survive being a parent or carer of today’s teenagers. The Croydon Voluntary Group is largely run by people living with diabetes under the care of Croydon University Hospital. We offer advise and awareness talks for the Croydon Community. There is no cure for diabetes. The good news is that three in five cases of Type 2 diabetes can be prevented or delayed. We’re supporting people across the UK to find out their risk and take action to reduce it. Croydon Recovery Network is your single drug and alcohol service for adults offering support to individuals across the borough. Don’t Bottle It Up allows you to work out what level of risk you are at as a result of your drinking, to access personalised advice online and, where appropriate, find out where you can get face-to-face support locally. We can help you with free and confidential debt advice and support. Citizens Advice Croydon provide free, confidential, independent and impartial advice and information on a wide range of issues, including debts, welfare benefits, housing, employment, consumer rights and relationships. Age UK Croydon cares about all older people in the London Borough of Croydon, and believes that later life should be an enjoyable and fulfilling experience. We provide vital services, focusing on the needs of those in later life. Starting on Monday 11th March 2019. This is a door to door service to Sainsbury’s in Purley Way. Our dementia support workers offer information and practical guidance to help you understand dementia, cope with day-to-day challenges and prepare for the future. They offer information to people who are worried about their memory and ongoing support to people affected by dementia face to face, over the phone or in writing. Croydon Neighbourhood Care is an Umbrella charity, working to meet the needs of isolated, vulnerable and frail people within the borough. We support local Neighbourhood Care Associations (our member groups) and provide services and advice to adults within Croydon. We are an NHS clinical service currently available across London. We work to empower patients to have choices about the care they receive and to make those choices known to those who care for them. We provide telephone information and advice to people with dementia, their carers, family and friends and at public events. We also run a support group in Selsdon, Croydon for current or former carers up to age 65 years, caring for people with dementia. Meets on the first Wednesday of the month 7.00pm – 9.00pm. Find out more about the Memory Tree Cafe. At St Christopher’s Hospice our vision is of a world in which all dying people and those close to them have access to the care and support they need, when and wherever they need it. Best Start is a service from pregnancy until your child turns 5. It is made up of a number of different organisations all working together to support you to give your child the Best Start in life. place you want, whenever possible. The Croydon Sexual Health Centre provides a free, comprehensive and confidential sexual health service. Stop Smoking London has been developed to support a London-wide initiative to help Londoners to stop smoking. Just Be Croydon provides smoking facts, quick tips and advice, podcasts, videos and helpful links to help you Be Smoke Free. The Sport and Physical Activity team currently run a free weekly programme of Health Walks accredited by Walking for Health. Our aim is to help people in the community to get out in the fresh air, exploring the abundance of green space and parkland in Croydon. Download the Change 4 Life app to see how much salt, sugar and saturated fat is in those family favourites. Get simple swaps to help you cut back on the sugar in your kids’ food and drink. The NHS 12 week weight loss guide combines advice on healthier eating and physical activity.